Hundreds paid tribute today to two fallen officers. Millville Police Officer Christopher Reeves had a funeral and was laid to rest today. He was killed in the line of duty when his cruiser was struck by a vehicle driven by a suspect fleeing from police. Acting New Jersey Governor Kim Guadagno has ordered all flags to be flown at half-staff to honor Officer Reeves. Officer Reeves was an eight-year veteran of the force. His wife, Susan Reeves, is also a Millville police officer. The Millville PBA has set up a fund for Officer Reeves’ son. Donations can be sent to “Officer Christopher Reeves Fund” at P.O. Box 1142 , Millville, N.J. 08332. A viewing was held this morning for Officer Brian Lorenzo at the Cathedral of Saints Peter and Paul in Center City. A funeral mass followed. Officer Lorenzo was on his was home from work on his police motorcycle when he was struck by a drunk driver driving the wrong way on I-95. Lorenzo is a 23-year veteran of the Philadelphia force and highly decorated. Mayor Nutter ordered flags around the city lowered to half-staff in Officer Lorenzo’s honor. The Fraternal Order of Police Philadelphia Lodge 5 announced an account for Officer Lorenzo’s family has been set up at the Police and Fire Federal Credit Union in the name: “Brian Lorenzo Memorial Fund.” Donations for his family can be made at any PFFCU branch or other PFFCU members can make transfers directly by phone at 215-931-0300. 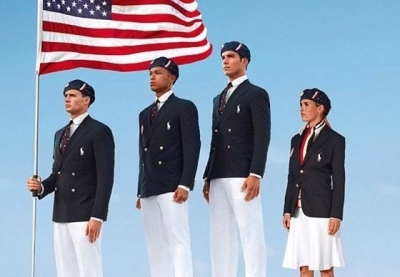 Ralph Lauren has designed the official uniforms for Team USA for the upcoming London Olympics. This is the matching outfit that the entire team will wear, regardless of sport, when the Olympic stadium during the Opening Ceremony on July 27th. It features white pants, a blue blazer and beret, with a white shirt and striped blue and red tie. The uniform itself looks sharp and maybe a little preppy, but has gotten many Americans upset, but not over the design. The uniforms are being manufactured in China. Understandably for cost reasons many companies outsource manufacturing overseas, but for a limited run of specialty designs for the USA Olympic Team, an American textile firm could probably have been awarded the contract. An alligator got loose in the postal sorting facility in Trenton, NJ on U.S. Route 130 near Klockner Road. The 12 inch gator escaped from an express mail package inside the the post office. It got out inside a large sorting bin and was found by postal workers in the facility a short time later. Neither the alligator nor the workers were hurt. Postal inspectors did not say where the gator came from or where it was going. Strangely, it is not illegal to ship an alligator that is under 18 inches.